Deliver a clear concise learning experience and a powerful presentation to your teaching staff. Powerpoint Presentations are now reduced from $99 to only $79 each. * Checks/Purchase Orders Not Accepted for PowerPoint Orders. Click here to view the complete list of Staff Development PowerPoints. Eric Jensen’s PowerPoint from the presentation at the Kennedy Center in DC. Learn why visual, tactile and musical arts are so essential to our students. 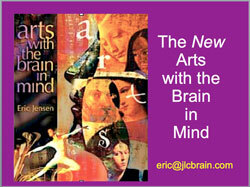 You’ll get a colorful and engaging presentation, with 85 fresh new slides that explore the research behind the arts. Many studies suggest that arts can have a significant and lasting positive effect on student learning. But what exactly does the research tell us and how much arts are needed to change the brain?Discover what the research says and find out if arts should be assessed or not. 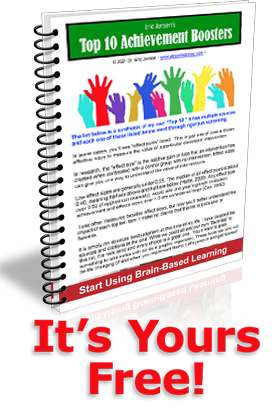 Great this great persuasion tool for parents, administrators and school board. Expect staff to gain background and strategies to implement immediately.